What is Equistro Flexadin UCII? 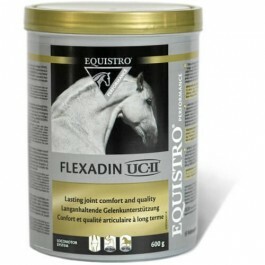 Equistro Flexadin UCII is a complementary feed supplement that supports lasting joint health and mobility. Using a combination if MSM and chelated manganese, this formula helps protect joints from the wear and tear that intense effort and regular exertion can bring. The formula for Equistro Flexadin UCII is analysed for environmental contaminants, ensuring that the product does not contain ingredients likely to make a positive doping test. What are the benefits of using Equistro Flexadin UCII? What is in Equistro Flexadin UCII? Lactose, Methyl sulphonyl methane (MSM) 39.6%, chicken cartilage powder (UCII®): (containing Potassium chloride: 0.96%, total collagen: 0.8%) 3.2%. Additives/kg: Compounds of trace elements: Manganese as manganese chelate of amino acids, hydrate (E5) 480 mg.
How do I use Equistro Flexadin UCII? Horses (500 kg): Initial period 15 g (1½ scoops) once per day for 12 weeks. Horses (500 kg): Maintenance 10g (1 scoop) once per day. Mix with the usual feed. Is there any further advice I should know about Equistro Flexadin UCII? Due to the presence of manganese with maximum set limits, administration must not exceed 3000 g/ 500 kg horse/ day.